One of the cool things about being an editor is getting the chance to work on so many wonderful novels. 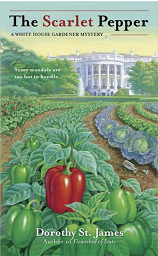 One of the very special novels I’ve had the pleasure to edit is The Scarlet Pepper, a White House Gardener Mystery, by Dorothy St. James. With enough votes, The Scarlet Pepper could be put on the ballot at Malice Domestic for Best Novel of the Year -2012. And wouldn’t that be cool? Words cannot express the joy I feel for just knowing other people enjoyed that novel just as much as I enjoyed working on it with Dorothy. 2) Missing punctuation: make sure every sentence has punctuation. 3) Misspelled words or missing words: spell check is helpful but doesn’t check for things like a missing “c” in “exited” when it should be “excited.” Your editor should do their job and help with this, however it’s great for the writer to get into a habit of checking these things. 4) Chapter Headings are consistent: do you want your chapter headings centered? Bold? A different font size? Three hard returns above the first paragraph of your chapter? Whatever you decide, consistency is important. 5) Paragraph indents, margins, and spacing between paragraphs is consistent: sometimes this can be tricky to fix after several drafts of revising, but if you begin your novel in a certain format with specific spacings, there shouldn’t be too many issues down the road for you. Be aware of this early on. The Romeo and Juliet Code is a very good book. It has a lot of action, suspense, love, and happiness. The setting is World War II, when a young British girl, Felicity, is sent to live with her uncle, aunt, and grandmother in Maine until the war ends. During her stay, Felicity finds letters from her father addressed to her uncle that causes her great concern. While dealing with trying to figure out the code of the letters, she gets her first crush. WD’s Editorial Tip: This is a great example of how to take a character out of their comfort zone and place them into a different culture they’re unfamiliar with in a real-life setting. As we begin a new year, it’s easy to stress over all the writing goals you want to accomplish in a year’s time. Take a deep breath, now make a list, and prioritize it. What’s the one most important thing you’d like to accomplish that is writing-related in 2013? Is it finishing the novel of your heart? Starting a new novel? E-publishing? Getting fresh eyes on New marketing strategies? A new look for your website? Getting a website? A map for your novel? A character novel bible for your series? Perfecting that query letter or synopsis? A writing coach to help motivate you to keep on top of your goals?